Japchae is popular Korean dish of stir-fried sweet potato starch noodles, vegetables, often meat, and a soy and sesame oil dressing. My vegetarian japchae recipe focuses on fresh and light flavours such as mint and cucumber to welcome the warm weather. Sweet potato starch noodles are also known as glass noodles or Korean vermicelli. They’re super long, springy, and gluten-free. You can find these noodles at most Asian grocery stores, but you best bet is a Korean grocer. This is the perfect recipe to make for a friend or family gathering. It’s so simple, nourishing, and everyone loves noodles. To make it vegan just remove the egg! Bring a large pot of salted water to a boil. Cook the noodles according to package instructions. Rinse in cold water and drain. With scissors, cut the noodles into manageable lengths and toss with a drop of sesame oil to prevent sticking. Set aside. Pour 1/2 cup of water or so into a large skillet over medium heat. Add the spinach and allow to sauté until wilted. Drain and rinse under cold water. Squeeze out excess liquid. Set aside. Whisk together the eggs and salt. Heat the skillet over medium heat and wipe a thin layer of oil over the surface. Pour the egg mixture into the pan and spread out into a thin crepe like shape. Allow to cook until bottom begins to set. Flip and cook for an additional 30 seconds. Transfer to a plate. Once cooled, roll up the egg and slice into 1/4" thick pieces. Make the dressing. Whisk together the tamari, sesame oil, honey, sesame seeds, and chill flakes. Wipe the skillet clean and place over medium heat. Add the noodles, dressing, spinach, cucumber, and scallions. Toss until combined and hot. Remove from heat and and garnish with eggs, mint, and sesame seeds. Serve immediately! 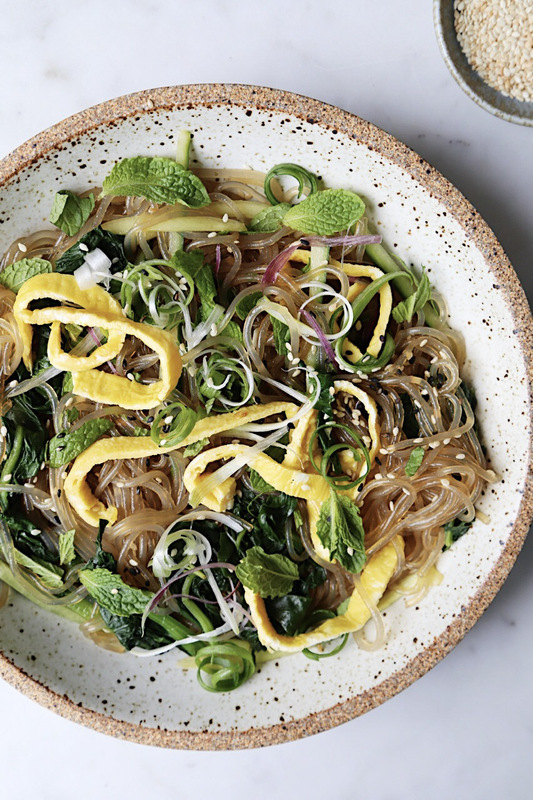 This entry was posted in Main Dishes and tagged glass noodles, gluten-free, japchae, korean, local, noodles, organic, pasture-raised, potluck, seasonal, spring. Bookmark the permalink.